News and reflections from staff and volunteers working with Partners Relief & Development and other agencies. Our team mission: Free full lives for the children of Burma. Our hope: reconciled communities living in peace. Thousands of displaced Rohingya still receive ‘no aid’ | Democratic Voice of Burma. I don’t know if I have ever seen a grown man cry the way he did. Jakil walked into the room we were sitting looking serious and determined. His hair was combed and well-kept, he was wearing a nice shirt and the traditional Burmese loyngi. 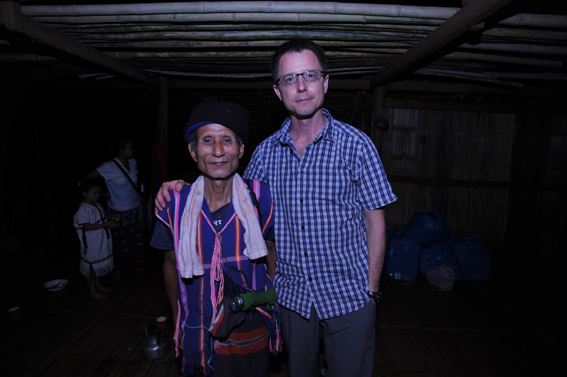 I was in a refugee camp in Arakan state. I did not know that people could survive on so little. Today I was walking through an area covered with small tents and people in all ages. The camp was one registered by the government.The people living here received a small ration of food once a month and a simple tent that would serve as their house. They were also given some toilets to share with hundreds of others. Some words about people who are in desperate need of what the bible calls “Neighbors”. Have you ever met people that are so unloved that a whole nation wants them to die? You, know, kind of like the Jews during WWII. Have you ever wondered what it would be like to belong to a people group that is despised, unloved and systematically oppressed? What would it be like to tell your child that she or he are not allowed to go to school because they government has decided that people with their skin color and religion do not belong in their country, and therefore, they have no right to education. What would that feel like if you knew that your people has faithfully served and lived in the nation for several hundred years? She was sleeping. If my memory serves me well, she wore a bright T-shirt and beige tights. By her size I guess she was four years old. Her face was clean, hair shiny black and parted on the side, like she had just bathed. She was beautiful, resting on the split bamboo floor like some Karen angel. Rose hoped up the stoop behind her bamboo shack with a bowl of rice and a plate of curry for us to share. “You must be very hungry.” she said as she set down the dishes. This was our fourth visit to Sho-Klo camp and Rose had already become a fast friend to my wife and I. As I drew my spoon out of the yellow curry I asked her who the little girl in the corner was. The photo of this little girl was taken in August 2011. 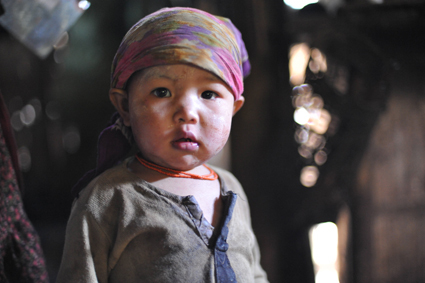 She is a refugee in Kachin State (IDP) because of Burma Army attacks on her family village in North Burma. I don't have a picture of the 30 dollar child, but I think of her all the time. We started our work with one little girl and 30 dollars. We continue the same way today: one life and one step at a time. Rose said that the village was attacked, burned down, and deserted a week prior; that KNLA (Karen National Liberation Army) soldiers were sent to document the event, try to determine what happened, and help survivors if any were to be found. When they arrived they found the remains of a rice-growing village. Walking through the rubble they heard a sound, followed it, and discovered the source: it was this little girl. Rose paused. We hadn’t eaten the steaming rice in front of us. The little girl kept sleeping, curled in a ball like a kitten. They soldiers carried her for a few days to the Moi River, crossed into Sho Klo refugee camp, and walked the trails along the sho Klo river to St. James Anglican Church. Next to the church was the bamboo shelter belonging to Rose. The little girl was left in Rose’s arms. We showed up the next day. Breaking through the granite of my self-centered hypocrisy was this wonderful life in the arms of a woman who herself had survived tremendous pain before arriving on the border. The little girl sleeping on her floor was vulnerable in so many ways and needed nurture and protection. Rose was willing to take her in but she needed a Partner in the project –someone to help provide the basics for this new member of her family. We calculated the cost of care for Rose to become her foster mother. Flip flops, school fees, an umbrella, supplemental food, clothes. Total Cost: 30 dollars. We went through the numbers twice, three times. The result was that it would cost Rose a total of 30 US dollars to provide comprehensive care for this little girl for an entire year. I want to be like Daniel when I grow up. Daniel has a warm smile, wears a polyester knit hat that is always tilted sideways, and carries a flashlight around his neck in a pink hand-made sling. He smiles when he talks. When he prays, the lines on his face crease with intensity as he squints, head angled upward to God, the tone of his voice beckoning engagement with God. I met him last April in Eh Htoo Hta refugee camp when he led a ‘thanksgiving service’ my family was invited to. He often leads these services for families and communities when there is a birthday, a graduation, or other significant event. I love the image of refugees meeting together at the edge of human existence giving thanks to God for life, opportunity, and each other. Inspiring. After the service I sat down beside him and asked him about his life and how he ended up in the camp. Here is what I recorded of that conversation in my journal. “ I am 67 years old. The Burma army burned down my house for the first time in 1958. Since then, they have destroyed 8 wood homes in different locations that I have built for my family. That doesn’t include countless houses we have lived in that were built out of bamboo. I had nine children but now I have six. In 1986 my 18 year-old son walked to a village controlled by the Burma Army to try to barter for some food. When he was questioned by soldiers and answered them in Karen language, the soldiers detained him. He was tortured, and finally killed. His crime was that he couldn’t speak Burmese. I came to this camp in 2007. At the time I was living in Mon Township, a week-long walk through the jungle from where we sit now. The Burma Army burned down the village I was living in, including our church, and killed many people. Daniel has lived through tremendous suffering and loss, yet lives today to tell his story finishing with a tone of triumph. Today is fathers day in the United States. As I reflected on a dad I have met who embodies the sort of characteristics and virtue I strive for myself, I thought of Daniel. He’s a man who loves his family and lives to serve others. He smiles from his soul where God obviously lives. For the weekend: a picture turned into a prayer. In January 2008, after walking for nearly three weeks with 8 FBR relief teams,I arrived in Mo Po Klo just after midnight. The team members I spent the last ten hours hiking with made for the trees in the center of the hide-site, tied their hammocks taut, and collapsed into well earned sleep. I felt I couldn’t sleep, even in the relative comfort of a bamboo shack, without first washing the grime away. I often pray for this curious three year old and his family. And I'm glad that in my groggy state I had the presence of mind to take his picture. He lives in one of thousands of hide sites full of displaced people inside Burma. Would you remember him in your prayers this weekend? I stumbled 100 meters down to the stream that runs through this cold ravine and fished the soap out of my backpack. It was pitch black. We were at high elevation. It was cold enough outside to see my breath, colder still in the water pouring out of a bamboo duct leveraging water up and out, splashing on a flat rock in the mud. I lit a pile of bamboo and twigs on fire, peeled my clothes off, and with a yelp, jumped into the mind-numbing tunnel of cold cleanliness. I looked ridiculous, a nearly naked white man in the jungle taking a shower by the light of burning bamboo at 2 am. I sounded worse, screaming like a crazed animal as I soaped, then rinsed in what felt like liquid ice. The dilapidated hut I slept in was home to a family of six. Their village was burned down the first time by Burma Army forces in 2006, and from then until now, they have had to run for their lives and find a new place to hide no less than twelve times. I shivered through the night in my high tech down sleeping bag, while they seemed warm in their huddle beside the coals of their cooking fire, nothing but ragged felt blankets around them. Before dawn I poked my nose out of my bag and met the three-year old second son. He was studying the blue rip-stop nylon my western mountaineering bag was made of, studying the pale tone of my white skin, studying the odd colors of my gear. I was his study. “He is the image of God, the light of Christ, three years old and displaced.” I thought to myself. He is the owner of a string, a formerly white long sleeve shirt, and son of a struggling family. He is a day- time hunter of lizards and night-time dreamer of dreams. He is a wonderful and curious image bearer of God, like my own children, whose life is marked by war-made poverty, yet brimming over with life and potential. Being in Burma and surrounded by so much sadness, violence, and loss, I was encouraged by the presence of this child. As he ate his breakfast of baked sticky rice and his mom boiled water to brew weak leaf tea, I mused that the light of Christ cannot be quenched by the grind of darkness. As you meet the people and scenes of Burma in our web site, magazines, and emails, be encouraged with me that the light of the world shines through us all into the darkest spots of Burma. Every sentence and image holds a story as personal and real as my own; every photo had a soul behind the lens turning the moment into a prayer. 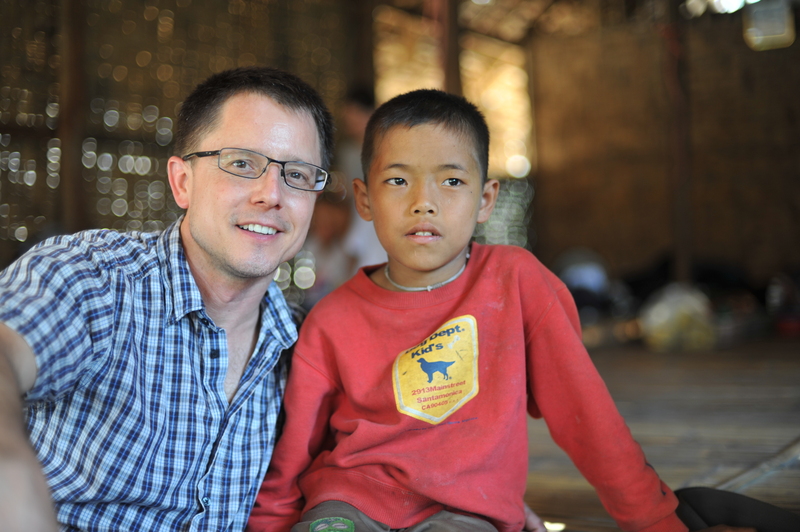 My icon of prayer for Burma: a nine year old boy named Jon. I wrote the following article for the last issue of our magazine about a boy named Jon (name changed to protect identity). After meeting him in 2009 I thought I would never meet him again. Since we met he has become a constant feature in my prayers, a life that epitomizes Burma, and a physical reminder of why I do what I do. What were the odds of meeting Jon again? We confirmed that he was indeed the same boy I met 250 kilometers away in 2009. He walked for six days with another family to meet his aunt who lived in that camp for refugees so that he could go to school and live in relative security. I prayed for him and gave his aunt some money for clothes and school supplies. My family made the commitment to help him with schooling and whatever he may need as he grows up in a war zone with no parents to watch out for him, and a mere boy who has been visited with terrible violence. Partners Relief & Development helped Jon and his community by sending food, shelter, and provisions after Burma Army attacks left more than 28,000 people destitute and homeless in 2008. In the case of Jon, I get to be the answer to my own prayer. I am blessed. Jon is a 9 year-old Karen boy I met in Burma in 2009. He lived with his uncle in a temporary camp that housed 697 people whose villages had been destroyed by Burma Army forces. Most of the people living there have had to flee to new hiding places 12 times since 2006. The relief teams I was with were setting up a presentation for the children in that camp. As the children started to arrive I noticed Jon. He had a mischievous grin, a confident stride, and a slingshot in his back pocket. I tapped his shoulder and asked what the slingshot was for. “Birds” he replied with a dry smile, as he joined the others beside our bamboo hut. Later that day I asked the community leaders if I could hear the stories of some of the people who have survived attacks. Among the 10 people who crowded into the hut to talk with me was Jon. Along with help from his uncle, he told me his story. In 2005 Jon’s father made a decision. Having lived under the constant threat of violence, extortion, and abuse by local Burma Army forces, he gathered his family of four and hiked deep into the jungle to hide from the soldiers that harassed them. For two years they lived off the land, foraging for food and enjoying relative peace and security. But in 2008, just after burning down the village Jon was born in, the Regime forces discovered Jon’s family in their hide site. The leader of that patrol pulled the pin on a hand grenade and threw it at the family. Jon’s dad caught the grenade and was blown up in front of the family. Somehow Jon, his mother, and older sister escaped. The following year Jon’s mom hung herself from a tree and died. Later that year his older sister got sick and died. It was then that he found his way to his uncles hide site. Jon is a smart child. He was articulate and brave as he recounted his story. He somehow finished first grade but didn’t want to go to school anymore. Instead, he wanted to hunt birds in the jungle. I looked Jon in the eyes and pleaded with him to go to school, help with chores, and be the man he was created by God to be, despite the destruction of so many sacred things. I left money with his uncle to help with food and school supplies. I prayed for them. His community lives two hours on foot from a Burma Army camp. The landscape around their valley was peppered with the soot remains of burned down villages. His neighbors all bear the scars of Burma Army abuse. I asked his 58 year old uncle how many times he has had to run for his life. “More times than I can remember” he said. That’s it. That’s what our advocacy program is all about. That’s why we worked on Displaced Childhoods, why we develop reports for policy makers, why we work with lawyers to feed litigation moves for justice, why we stand with other organizations like FBR and ERI as they appeal for justice. It’s why I write this article and why my team-mate Ryan made a video about nine year old Naw Paw Ta Em Mu. We are all learning to do right, to seek justice, to take up the cause of the fatherless, and to plead the case of the widow. We are learning as we plead, what it means to be faithful to the gospel. This blog was supposed to be a vault for my personal story in Chronological order. But the people of Burma have become one of the important features in the landscape of my life. Though this story skips 20 years of narrative, it is part of the same story. 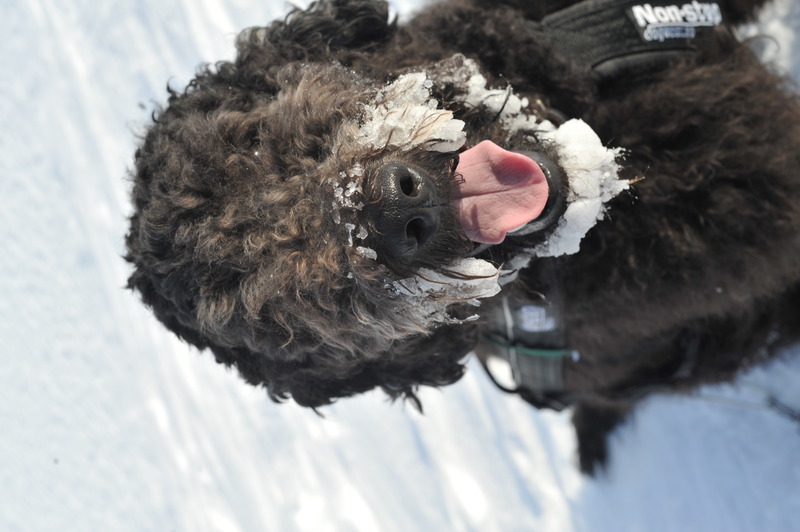 And this is my beloved dog, Bob Marley.